We’re Giving Thanks For Our Thrive Members! We are thankful each day for our members and guests! But this is the time of year when we give more conscious thought to it and say it out loud. We appreciate you! Eat breakfast and don’t try to save up calories for dinner. It may seem like a good idea to skip breakfast and try to save your calories for later, but that just doesn’t work. Your metabolism won’t be firing well and you’ll find that when you’re over-hungry, your ability to make healthy choices declines dramatically. Eat a healthy breakfast, nutritious snacks and even lunch if your Thanksgiving dinner won’t be until later in the day. Get active. Ramp up your metabolism by moving! 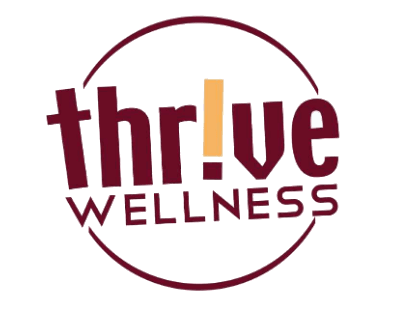 Put the turkey in the oven and then come and get a workout in at Thrive Wellness. We’ll be open and ready to serve you on Thanksgiving Day from 7:00 a.m. to noon. Whether you choose a moderate or heart–pumping cardio workout or an invigorating resistance training workout, you’ll feel better, reduce stress and be hundreds of calories ahead of the game! If you can’t make it in to Thrive, how about going for a brisk walk instead? Just get a move on! Go for lower fat and calorie options. Whether you are fixing the dinner and contributing to it, lean down your dishes. Instead of using butter and cream in your potatoes, try fat-free chicken broth and/or fat-free sour cream or plain yogurt. Baste the turkey and make your gravy with chicken broth, too. Sweet potatoes are delicious without a lot of added sugar and marshmallows! How about using fat-free evaporated milk in the pumpkin pie? Reduce oil and butter wherever possible. Check out the buffet before making choices. There are lots of holiday favorite foods that you don’t want to miss out on. Take a good look at the buffet line and choose your favorites that you don’t get the rest of the year. Don’t eat extra “obligatory” foods because they are “good for you” if it just means you’re consuming more calories. Pick the foods you’ll be satisfied with and enjoy them completely. Watch your portions. Picking your favorite foods doesn’t mean you shouldn’t watch your portion sizes. Make wise choices and don’t overdo it. Just because it’s a holiday, it doesn’t mean that calories don’t count. You’ll feel better later if you have reasonable portions and don’t stuff yourself. The first bite of any food is always the best…after that, it’s just more of the same! Skip seconds. Don’t let Thanksgiving be a license for overdoing it. Do you really need a second plate? Really? Pick a reasonable size plate, small portions of your favorite foods and don’t go back for seconds. There was a recent report that stated that the average American consumes approximately 4500 calories on Thanksgiving! You can eliminate a lot of calories by not going back for seconds. You’ll feel better and have more leftovers for tomorrow, too. Slow down. Take your time eating. A lot of time has been put into the preparation of the meal so slow down and enjoy it. Give your body a chance to register that it’s full before you eat more. Eating slowly, putting your fork down between bites and fully savoring each bite will go a long way for you to enjoy your meal and not overeat. Skip the alcohol. There are a lot of calories in alcohol that make weight loss or maintenance very difficult. If you can stick with sparkling water, your waistline will appreciate it. If skipping alcohol on the holiday is just not going to happen, limit yourself to a small glass of wine or a wine spritzer. Get back on track immediately. If you eat more than usual on a holiday (or anytime), get right back on track with the very next meal. Too many times we think we’ll restart the next day or “on Monday,” but why wait? The sooner you regain control, the less harm done. Enjoy your family and friends. Thanksgiving is more than the abundance of food but a great time to celebrate family and friends. Get out the board games, go for a walk, enjoy the time you have to spend with loved ones or even volunteering to serve those less fortunate. We all have much to be thankful for. By exercising a bit of restraint, you can enjoy the holiday without sabotaging your health. Enjoy!